UPDATE, 9:30 a.m. PDT, July 4: The drone show scheduled for July 4, 2018, at Travis Air Force Base has been canceled and rescheduled. Intel released this statement: We decided to cancel the performance today as a result of high winds that would have interfered with drone flight. Our drones can fly in winds up to 18 miles per hour, but the forecast calls for winds over 30 mph for the time frame we were planning to fly. We emphasize safety in our drone performances, including in our operations, the design of the drones, and the use of systems like geofencing and auto-land contingencies. We felt that canceling the show was the best decision under the circumstances. Our drone light show is rescheduled for 9 p.m. PDT, July 5, pending adequate weather conditions. What’s New: Travis Air Force Base in Fairfield, California, will collaborate with Intel to replace a traditional Independence Day fireworks display with an Intel® Shooting Star™ drone light show. In celebration of July Fourth and Travis Air Force Base’s 75th anniversary, 500 Intel Shooting Star drones will dance across the nighttime sky in a choreographed aerial routine that honors active military and veterans. Why It Matters: The origins of fireworks on July Fourth dates to 1777. For the first time, an Intel Shooting Star drone light show will celebrate Independence Day with an elaborate ceremony. 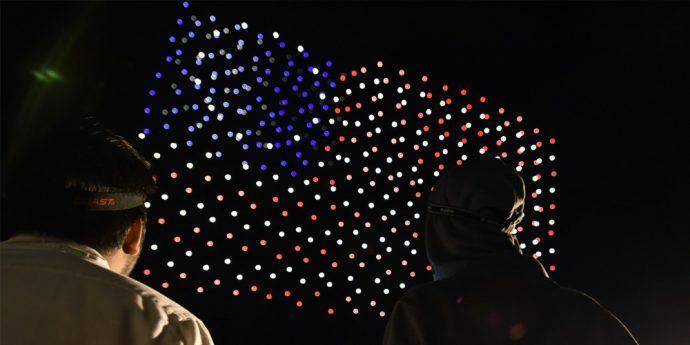 This drone light show will be a more inclusive July Fourth celebration that can be enjoyed by all families, especially those with sensitives to the sounds of firework explosions.